Fiona by Fiona - tween fashion for girls that won't make parents cringe! Fiona by Fiona – tween fashion for girls that won’t make parents cringe! It’s hard sometimes these days, being the mum of girls. Once they hit their tweens, you’ve got to tread that increasingly wobbly tightrope between encouraging a healthy body image and age-appropriate clothing while pandering both to their own emerging fashion sense and their oft-fragile sense of self. That’s why we’re in love with Fiona. 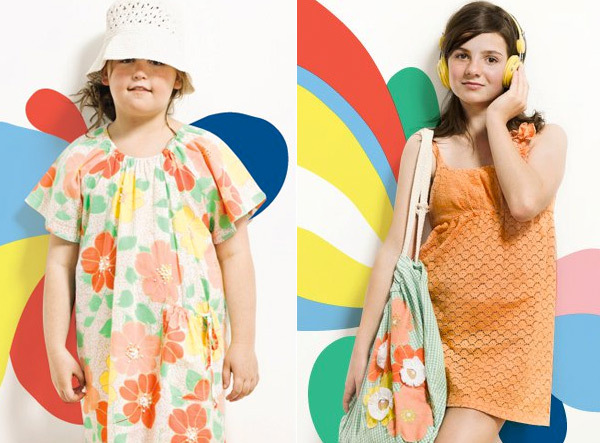 Fiona by Fiona is the tween sister label to one of our favourites, Big by Fiona Scanlan. It kicks in where Big leaves off, with clothing for girls aged between eight and fourteen. It’s fun, it’s age appropriate and it’s very, very fashionable. So it’ll keep budding fashionistas happy while ensuring mums and dads won’t turn pale in shock when their tweenage daughters front the breakfast table each morning. Fiona has just released its new Big Love collection for this coming summer, with a campaign that uses preteen models who are beautifully natural – including Scanlan’s own nine-year-old daughter George – the perfect antidote to much of the mass media messages that bombard young girls these days. It’s not just about the clothes – as lovely as they are – but about the social media campaign that comes with it. There’s a blog, a Youtube video and a Facebook page that tween parents can confidently allow their daughters to access to get their fashion fix without worrying about the messages they might be sending to such impressionable young minds. Well done, Fiona! Want to see the clothes? You can find the entire Big Love summer 2011 collection at Fiona.